As a security guard provider Echelon realizes that the ability to quickly collect, deliver, and access the information that our security officers provide is critical. As a result of that understanding, Echelon uses OfficerReports.com to manage and help supervise our security officer reporting process. This effective Security Guard Reporting App speeds the delivery of important information from our officers to our clients by delivering their reports via the web. The submitted reports are securely stored in the cloud so that Echelon and our clients have instant access to them whenever they are needed. Our clients typically face an over-burdened workload every day. By using OfficerReports.com we can minimize the time associated with reviewing our officers’ reports. Our clients are able to get an overview of the security function in one place in just minutes, giving them more time to manage their other daily tasks. For most of our clients the amount of paperwork that they handle from day to day can be a nightmare. By using OfficerReports.com we are able to reduce the amount of security related paperwork that they must handle. Our clients can just log into our client portal to review all their security reports. Another challenge that our clients face is managing the maintenance and upkeep of their facilities. Regular upkeep is a must to help keep your employees and customers safe and secure. 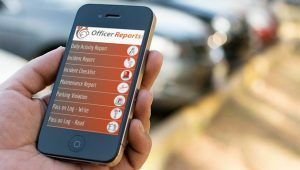 OfficerReports.com allows our clients to review and manage any maintenance related issues that have been identified and reported by our officers. 3) Real time review of incident reports. Premises liability lawsuits result from the failure of business proprietors, to implement reasonable and ordinary security measures for the protection of their customers or employees. Such measures may include monitoring, lighting, repair of locks, and overall maintenance of the business property. Our Security Guard Reporting App helps reduce your liability by allowing you to accurately document the management of any security related matters. As part of our Security Guard Reporting Service we also offer our clients the ability to track our officers’ patrols in real time through the use of a Guard Tour Tracking System. Guard tour tracking systems have become an essential tool for security guard companies. The purpose of a guard tour tracking system is tomonitor the time and log the activity of security officers while making rounds of your property. These systems are designed to prevent costly losses such as vandalism, theft, corporate espionage and damaging accidents.